Thinking “inside the box” saves money for Aroma Housewares & their customers! Aroma Housewares Company, (San Diego, California), offers an extensive line of counter top kitchen appliances products and services which surpass traditional functionality and value, with special emphasis on value engineering. Part of Aroma’s core business values include “open minded creativity” and “unyielding reliability on delivering our commitments”. As part of their constant strive to improve customer service, Aroma Housewares management team decided to closely examine the material handling and logistics segments of their operation. Harold Skinner, Global Supply Chain Manager said, “our primary goal was to maximize the cube of outbound customer shipments which could potentially save as much as 50% on freight costs in some instances”. He went on to say, “given that we are also receiving 100’s of inbound sea containers per year, it was imperative for us to analyze costs relating to our receiving and material handling and to identify ways to make improvements in these areas”. Their studies concluded, “floor-loaded-pack-bundles and master cartons were taking an average of 6 man-hours per container to off-load and palletize! Skinner said. The need for improved methodology was evident and they quickly began development and testing of a ‘pallet-less cube’ concept. Their final solution was the development of a stretch-wrapped unit load complete with cardboard load caps and corner protectors, (for rigidity), which could be placed on a solid fiber slipsheet or DST tray instead of a pallet. Their factory was in complete agreement with this concept and they were pleased to confirm they were also able to include the same number of units per container as they did when bulk loading by the piece! Following their own business philosophy, (of designing products that make work easier), Aroma Company began looking for the material handling product which would best fit their philosophy and offer the most cost effective, versatile and efficient means of handling their new ‘pallet-less cube’. Their search directed them to Meijer Handling Solutions RollerForks®. They soon contacted Mike Yacks of Meijer Handling Solutions Inc.. Mike reviewed their application requirements and goals along with Harold Skinner and followed up by providing a set of “demo” RollerForks for on-site testing and evaluation. The rest, as they say, “is now history”. The forks worked so well during testing, Aroma recommended them to their factory in China. 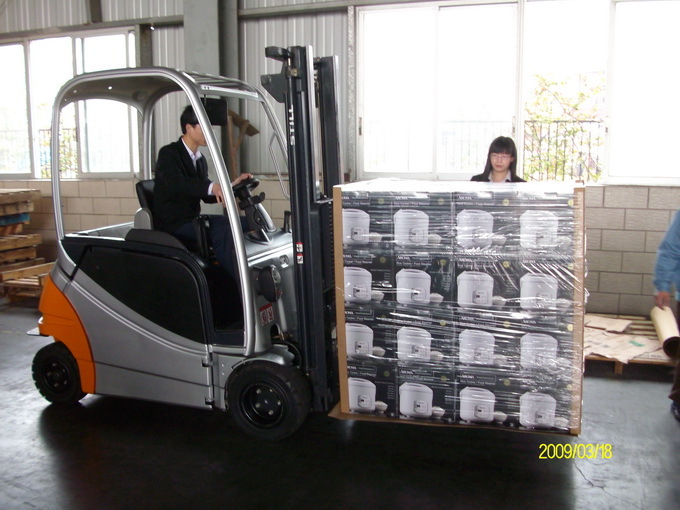 Their colleagues contacted Vita Wheel, (Meijer Handling Solutions distributor in China), and they too, gave the “thumbs up” to the innovative Meijer Handling Solutions RollerForks®. Harold Skinner says, “We just received the first container of pallet cubes from China last week and the RollerForks worked great!”. When we floor loaded the pack bundles, it took 2 hours for a team of 3 to unload the container, with the RollerForks one person unloaded the first container in 30 minutes!!!”. He is also quite proud to boast, “the forks will probably save us $10,000’s per year in labor and allow our operations staff to focus on outgoing orders to customers. This is part of our company’s Lean implementation program, which eliminates wasted movement”.